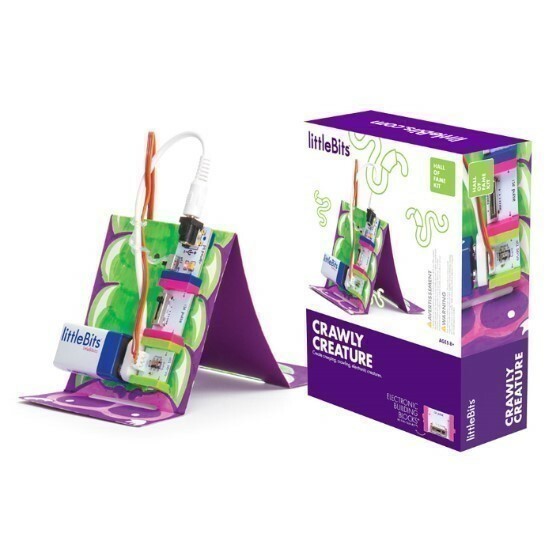 With the Crawly Creature Hall of Fame Kit kids can create their own creeping crawling electronic pet. The hero invention is the Crawly Creature which uses a servo motor to inch across the floor like a caterpillar. Kids can then remix the electronic building blocks in the kit to create a second invention: the Moving Collage. This interactive poster empowers kids to get silly and creative using craft materials and magazine cut-outs to make a memorable piece of art. Once kids create the inventions in the box itƒ? ?s time to use their imaginations combining all their Bits & kits to create brand-new inventions. Bits accessories and instructions included.